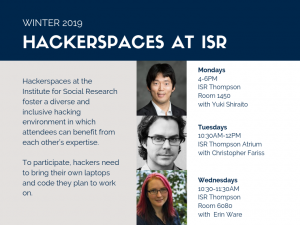 Dr. Fariss is excited to host a weekly Tuesday morning hackerspace from February 12 until April 23. Dr. Fariss uses computational methods and the statistical program R to study why governments around the world torture, maim, and kill individuals within their jurisdiction, and the processes monitors use to observe and document these abuses. Other research projects cover a broad array of themes but share a focus on computationally intensive methods, research design, and the analysis of data at a massive scale. 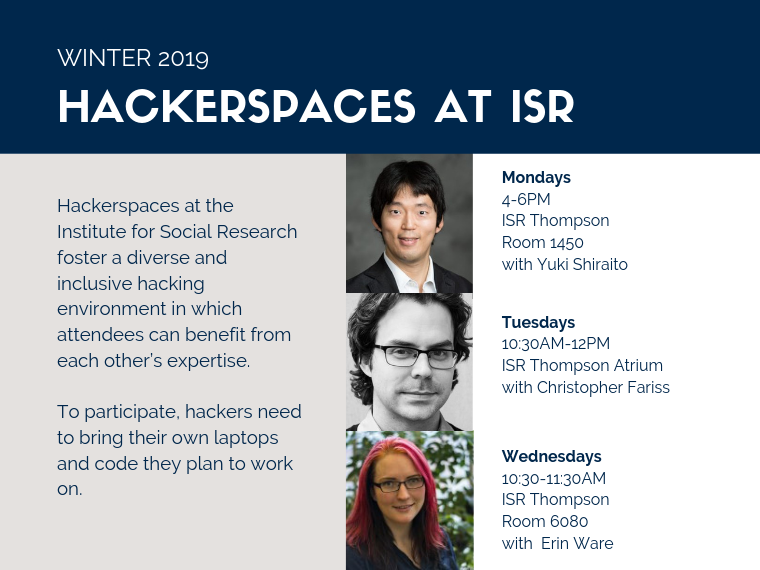 This weekly meeting with Dr. Fariss is for those with an interest in the R statistical programming language. Both beginners and experienced users are invited to attend. Dr. Fariss plans to introduce mostly introductory material during these sessions but will also cover Bayesian modeling in R and STAN.